Spring is a period for celebration. Flowers are in bloom, people are stepping outside to enjoy the fresh air and temperatures are rising. With the beautiful weather and flourishing surroundings, it's only natural that the timing feels right for entertaining. Spring gatherings can be intimate or accommodate larger groups. Whatever the size of your celebrations, it's always fun to incorporate a theme or party idea. Here are 25 inspiring party themes for your next spring gathering. Spring is when you can say "Aloha" to the sun. Welcome the return of warm weather and beautiful days with an aloha themed party full of pineapples, tiki drinks, and pink flamingos. When you think of hot days, the Southwest always comes to mind. Celebrate spring with an ode to warmth, desert, and cacti galore. Flowers are a theme all their own. Make flower cupcakes to place amid bouquets on the snack table. These thoughtfully decorated desserts will easily set the tone for a delightful spring event. Popsicles are the ultimate warm-weather treat. With the temperatures rising, you'll soon turn to popsicles and other icy treats to stay cool. A homemade popsicle party is a great theme idea. Make these boozy pops for an adults-only party. Full of West Coast wanderlust? Bring the sunshine and palm trees to you with this incredibly detailed Palm Springs-themed pie. Watermelon is a favorite snack throughout both spring and summer. Get an early start celebrating the season with a watermelon party highlighting the refreshing fruit. Succulents and mini cacti are having a moment. They make the cutest addition to a table setting and your home decor. If you are having trouble deciding between flowers and cacti for your party, just remember that cacti will also outlast any flower. A taco party is straightforward and to the point. Have all your taco-loving friends over for a bash full of tortillas and toppings. Pour the margaritas and make some fun party decor, and you're all set for a great event. Hosting it on a Tuesday is optional, of course. If you've already hosted or been to a luau party this year and are looking for a twist on the tropical affair, consider a full-on flamingo theme. These pink birds are crowd pleasers and quite conveniently make the cutest decor. You can even make some flamingo cocktails for a less obvious touch. Spring is the time to be bold, bright and colorful. A vibrant rainbow palette at a party does just the trick. Learn how to decorate this pretty rainbow cake and let if be the star of your event. Donuts taste delicious and also make for a festive party theme. Try hosting a donut party for brunch this spring and you can make these fun donut balloons for whimsical decor. It's finally nice outside, so take that party outdoors. Why should we be celebrating inside when we've been cooped up all winter long? Find the nearest patio or backyard to dine, al fresco. Enjoy outdoor party games, sunshine, and blue skies. Pastels are often associated with spring. Buttercream yellow, mint green, and pale pink are great colors to incorporate into your tablescape palette for spring. Get out the guacamole and your sombrero because it's time to celebrate Cinco De Mayo. When the holiday is past, there's no reason for the fiesta to be over: keep your colorful decor–like this DIY fiesta party garland–and host a margarita party. Allow the star of your event to be your menu of tropical cocktails and blended drinks. Make this hurricane glass piñata to add to the fun. If you are lucky enough to accommodate an outdoor theater situation on your property, then this spring party idea is for you. A backyard movie party could be your new weekly, monthly or just yearly event. While the nights are getting shorter, the sun is still going down early enough for this to be reasonable for all ages to attend. ​With fresh blooms everywhere in sight, it's only natural to consider a garden theme for a spring party. This party theme idea is suitable for both outdoor and indoor events alike. An iridescent unicorn pinata is a festive way to welcome spring. 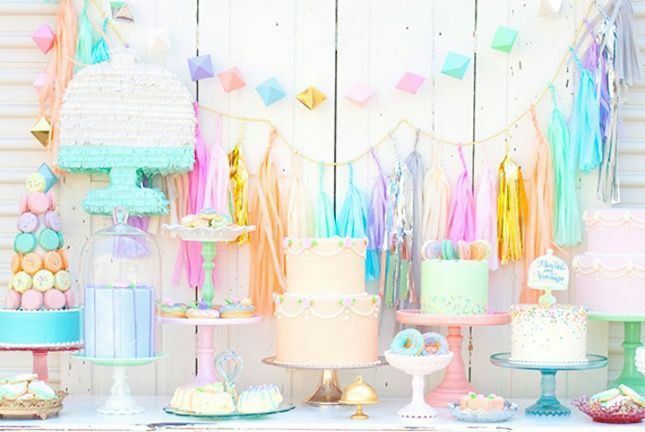 Full of pastels and whimsy, we love the idea of throwing a unicorn inspired gathering. This would be a great theme for a children's birthday party too! You can make an array of unicorn foods for a fabulous touch. Not only are fresh florals in bloom, but your local farmer's market also has a bounty of produce in for spring. A farmer's market theme uses only the freshest ingredients and your guests will appreciate that. A Kentucky Derby party is all about the hats. If you don't follow the race, do this theme just for the hats. The Derby is held the first Saturday in May. Pineapples are having their shining moment. Whether they are spray painted, your favorite shade of metallic, or on display au naturale, this fruit makes for a serious centerpiece at a spring dinner party. Not just any pool party–this is a swan pool party theme, complete with a fleet of elegant inflatable swans. Spice up your own pool party with these fun floaty additions. The sun makes its long-awaited return in spring. A gold party could not be more appropriate to celebrate the shift in temperature and the warm glow of a sunny day. A sorbet colored dessert table is another fun take on the pastel theme. Serve real sorbet amid the sorbet palette of table decor for an extra kick of color and texture. An ice cream crawl is a great activity to gather all of your friends together this summer. There are so many delicious flavors out there—take this opportunity to try all the local favorites in your neighborhood.